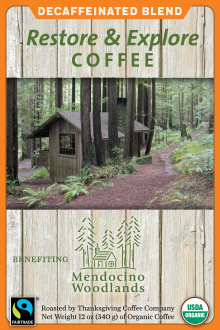 These coffees benefit the Mendocino Woodlands Camp Association: a nonprofit that has operated and maintained the Mendocino Woodlands State Park since 1949. 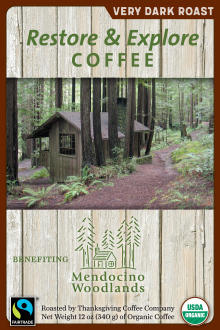 The Park is a National Historic Landmark and consists of three large, rustic campgrounds for group camps. Explore hiking trails, redwood groves, meadow, beaver pond, river otters, deer, fox, and more complete the magic of the Woodlands. MWCA also offers environmental education, via its Mendocino Outdoor Science School program. Your coffee purchase will aid historic restoration projects and environmental education programs in this special park.